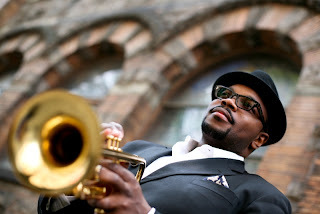 New York, Jeremy Pelt will take the stage with his quintet this Thursday, June 28 at 7PM over at the Brooklyn Museum. The show wraps up the six-event series Jazz: Brooklyn's Beat which is a partnership between Heart of Brooklyn and WBGO Jazz 88.3 FM featuring low-cost and free jazz performances in Brooklyn. The performance is free to members of WBGO and Brooklyn Museum while suggested admission for non-members is $12 adults / $8 students and senior citizens. Jazz: Brooklyn’s Beat, a month-long celebration throughout June, gives music fans of all ages a chance to enjoy world-class jazz music at some of the borough’s favorite cultural destinations. Heart of Brooklyn and WBGO, in collaboration with Brooklyn Museum, Brooklyn Botanic Garden, Brooklyn Children’s Museum, Brooklyn Public Library, Prospect Park Alliance and Prospect Park Zoo, have been working together since 2007 to bring jazz musicians, singers and artists from around the globe to Brooklyn. The series showcases the borough’s diversity and the musical form of jazz through concerts, dances, lessons and more. For more information, please visit www.heartofbrooklyn.org/jazz or www.wbgo.org/brooklyn, or follow @heartofbrooklyn and @wbgo on Twitter (hashtag: #JazzBklynsBeat).